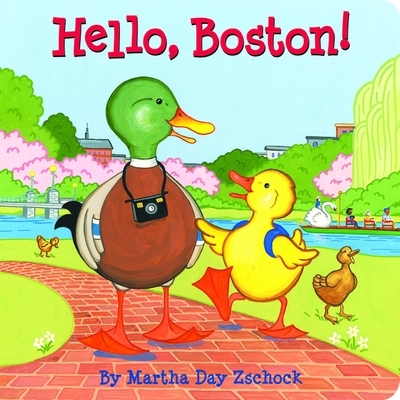 This board book about Boston from the creator of the bestselling "Journey Around" series, Martha Day Zschock, follows a parent and child duck as they explore the state capital of Massachusetts and New England's largest city. From Beacon Hill to the Old North Church, they learn about the city's history. They visit museums, run in the marathon, and eat some great New England food at Quincy Market. Of course, they cheer for New England's wonderful and winning sports teams Whether riding on the T, watching the duck boats, or enjoying July 4th fireworks, our feathered tour guides will remind children and parents (and grandparents) of a great visit to Boston. For ages 2-5. Made in the USA.